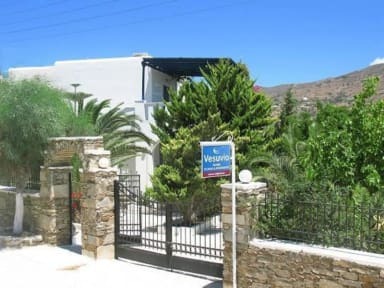 Within 300 metres from the sandy Yialos Beach in Ios, the Cycladic-stlye Vesuvio Kampos offers self-catering units with a balcony overlooking the Aegean Sea. It offers free Wi-Fi in all areas and free 2-way transfer from the port. Ios Town and Port, where a variety of restaurants and bars is featured, are located 1.5 km from Vesuvio Kampos. The long, sandy beach of Mylopotas is at a distance of 4 km. Free public parking is possible on site. All studios and apartments of Vesuvio are air-conditioned and feature a kitchenette with fridge and small electric oven with cooking hobs. Each includes a TV and a private bathroom with shower. Guests can prepare their own breakfast or other meal and enjoy it at the comfort of their balcony. 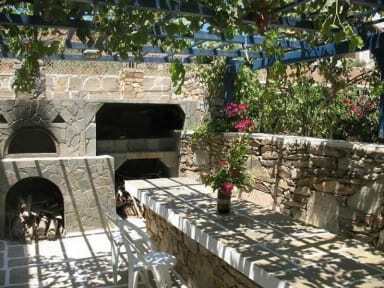 Stone-built BBQ facilities are also available in the garden for al fresco dining. Reception open from 09:00 - 21:00. Free transfer to our place from and to the port.